Standing in a National Civil Rights Museum in Memphis, David Horowitz is appalled by monuments that venerate Malcolm X and Elijah Muhammad. This is the scene that opens his new book, Hating Whitey and Other Progressive Causes. This is the book for which the Daily refused to carry an ad (because of the apparent offensiveness of the term "whitey"), and the book that Review staffers can be seen hawking in Angell Hall. 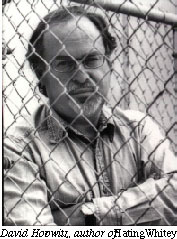 Horowitz, a biweekly contributor to Web daily Salon.com and editor of Frontpagemag.com, is a former 60s radical who once helped run a Black Panther elementary school. He describes a past idealism based in the idea of "equality for all," and a current conservatism grounded in the same idea. Of couse, this is the 90s, and "equality" for Horowitz now means the complete end of Affirmative Action, and the end of a "Leftist McCarthyism" that silences conservative voices on college campuses. As one who leans leftward more often than not, I was actually surprised at how many times I agreed with Horowitzs observations and analyses. Guess what? Elijah Muhammad, founder of the still-powerful Nation of Islam, was a racist. Heres a religious cultist who twisted traditional Islam into a form that soon appealed to disaffected urban blacks. Muhammad actually claimed that the devilish white man was a genetic creation of some mythical character called Dr. Yacub. Dont believe it? Check The Autobiography of Malcolm X. Its all there. Of course, Horowitzs attitude toward Malcolm X serves as an example for where the liberal in me strays from his side. Malcolm X was a dynamic leader whose views ended up in the realm of radical, non-racist progressivism, and whose life and ideas have provided direction and inspiration to millions of Americans, white and black alike. But Horowitz is right; mainstream liberal leaders like Jesse Jackson and Cornel West have publicly appeared with Nation of Islam leaders at events like the Million Man March, thereby tacitly condoning the anti-Semitic and anti-white rhetoric that they sometimes spew. 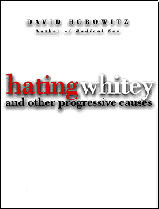 Therefore, Horowitz argues, racism against whites by blacks is often ignored and winked at in this country. The ease with which he makes this point is exactly his concern: If these instances of black-on-white racism are so clear, so cut-and-dry, then why does the predominantly liberal media ignore and dismiss it with such vigor? Look at OJ, he says. Look at the "black rage" defense that juries have actually swallowed in some murder cases. Look at the historical revision that has lionized the Black Panther Party, a group that Horowitz continually describes as a group of murderous street thugs. A lot of his points are well taken, but Horowitz often misses the point about why this form racism is somehow more often ignored or even forgiven. American history clearly teaches that of all the immigrant groups who have sailed to these shores in the last 500 years, only one came in shackles. Too often Horowitz compares the plight of blacks to that of Asian immigrants, Jewish citizens, and other groups. He does not choose to realize that African-Americans are racially marked in ways other oppressed groups are not, and completely denies the legacy of slavery that continues to affect the USA. Horowitz argues the nonexistence of "institutional racism," which is, simply, racism within the laws and protocols of the state and its public institutions. On this fine point, he makes a convincing case. Yes, being black would not hurt your chances at getting into Harvard if Affirmative Action were completely eliminated. Without a doubt, it is true that Americas laws and institutions do not follow racist protocol and have not for decades. But Horowitz fails to realize that the racism that exists is not experienced at the gate of, say, higher education, but along the long, winding path toward it. This conveniently narrow take on such a complex issue is reflected clearly in his near-unconditional worship of our Founding Fathers. " America and England," he writes, "are the nations that led the world in abolishing slavery and establishing the principles of ethnic and racial inclusion." Hello? Where did American slavery come from? And why did Americans allow it to thrive for as long as it did? To the author, racism is a thing of the past, and its time of death probably corresponds to the year he became disillusioned with radicalism. Horowitz allows for "individual" racists, of course, but suggests that this type of racism does not much affect the way people are allowed to live their lives. He seems to enjoy painting blacks and liberal whites as paranoid, irrational creatures who see oppression lurking in every doorway. His defense of Ward Connerly, conservative black spokesman for Californias Civil Rights Initiative, is actually quite admirable. Horowitz accurately paints the vocal college students who shout Connerly down and intimidate him wherever he appears, as hypocrites who seem to conveniently forget the principles of the First Amendment. As a liberal, I find these scenes embarrassing. If Affirmative Action is truly justifiable, then why all the smokescreens? The silencing? The shouts of "Uncle Tom"? Where are the facts and logical arguments? Its completely patronizing and borderline racist to assume that if an African American holds conservative views, then he or she must be a puppet of white conservatives. Halfway through Hating Whitey, Horowitz almost completely abandons the issue of race. What he explores, instead, are the ways in which the New Left is inextricably attached to Soviet-style Communism. He draws up a veritable Red List of sympathizers, and his only fault here is making almost no distinction between socialists and Stalinists. This amounts to a somewhat dangerous series of cheap shots. Many of them, incidentally, seem to be aimed at his "former comrades" and "Berkeley liberals" with whom he used to break bread. Now, it seems, they wont invite him onto their discussion panels even as a token righty. When he isnt doing this, Horowitz is describing a McCarthy-esque pre-censoring of conservative views within American universities. In this case, he highlights a valid liberal embarrassment: While the idea of "diversity" is upheld as a deity within ivy-covered walls, all dissenting, politically incorrect viewpoints are systematically removed before they reach the gate. The reformed radical often equates the questioning of American policies and values with dangerous anti-Americanism. Once again, his recurring invective against the Black Panther Party reveals that his examples are easy and extreme. Of course this group was anti-American, but does that mean that the "armchair Communist" (as Horowitz calls certain liberal scholars) is as well? Is the anti-Vietnam protester indirectly responsible for the atrocities committed by Pol Pot? By the end of this loosely woven string of essays, Horowitzs linking Leftism with un-Americanism, is still not quite watertight. The author chooses his Stalinist bogeymen so carefully and repetitively (the relatively un-influential Angela Davis gets mentioned ten times), that its hard not to wonder where all the rational liberals are hiding. Bill Clinton, however, becomes a demon not for any misguided ideology, but for a self-destructive nihilism that has allowed American nuclear safety to be threatened, the author claims. With favored-nation Communist friends like China having nuclear capabilities, I cant say I fault Mr. Horowitz for his concern in this department. Often, a complete about-face in beliefs has some sobering, positive consequences. Horowitz definitely has more credentials than do most conservatives to criticize Leftist views, although sometimes his targets in Hating Whitey seem to be chosen simply for the connection they had to his liberal salad days. Bitterness is definitely a dangerous tool, but its only one of many in Horowitzs shed.